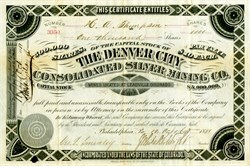 Beautifully engraved certificate from the Denver City Consolidated Silver Mining Co. issued in 1881. This historic document was printed by the Kendall Banknote Company and has an ornate border around it. This item is hand signed by the Company’s President ( J. Whitaker Wright )and Secretary ( George Smedley ) and is over 138 years old. J. Whitaker Wright, 1845 - 1904 - Financier and speculative promoter of gold mines during the late 19th century. J. Whitaker Wright was born early in Cheshire, England in 1845 and gained some formal learning in chemistry and assaying in his youth. At the age of 21 years he left England for a position as a mining assayer in the USA. He soon moved into the field of mine promotion and by 1875 was a leader in the mining boom at the Leadville center. He moved to Philadelphia where he continued his company speculations. He became a member of the New York Stock Exchange and, for a time, was chairman of the Philadelphia Mining Exchange. In 1899, when his fortunes collapsed, Wright returned to England and in the 1890s, specialised in promoting mining ventures on the London Exchange. He founded the British America Corporation which developed gold-copper ores of the Kootenays located in southeastern British Columbia. The speculation boom gave the area the reputation of a new Johannesburg. The Rossland district made a difficult transition from the pioneer stages of mineral exploitation to the modern industrial corporation. This boom caused enormous speculative interest among British investors who bought large amounts of stock. Unfortunately, the bubble collasped and one of the more sensational casualties was the financier James Whitaker Wright, organizer of the British America Corporation, who committed suicide in a London courtroom following his conviction on charges of falsifying company books.